"BVN bring a Sydney residential sensibility to 115 Bathurst Street, informed by a pedigree of innovative, award winning design"
A 66-storey tower designed to be Sydney’s tallest residential building. Greenland Centre is a residential tower development, located in Sydney’s CBD. 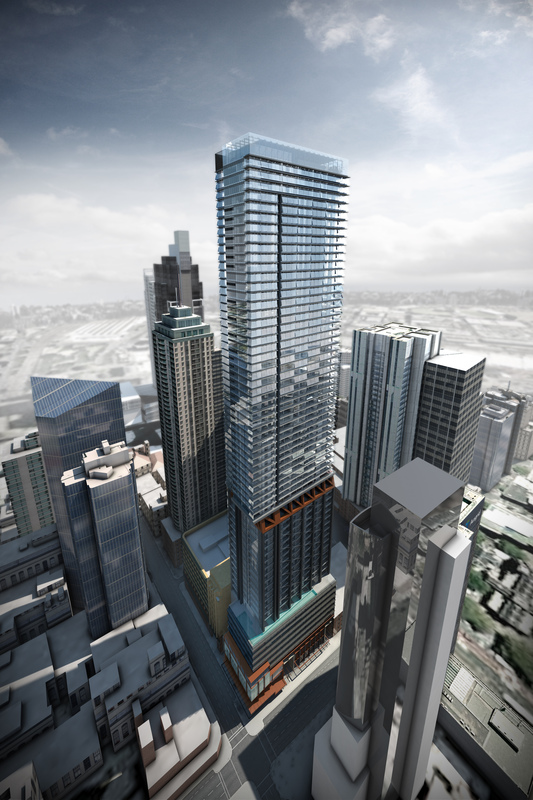 The 66-storey tower is designed to be Sydney’s tallest residential building. BVN was selected from a field of six international architects to design the tower through a City of Sydney Design Excellence Competition. The development includes 481 units, a Council-administered creative hub, retail spaces and a new public realm network associated with the retention of the heritage-listed Water Board building, which is undergoing adaptive refurbishment to become a boutique hotel. The adaptation of a 26 storey, 1960s commercial building on the site, and the desire to add a further 40 floors above the existing structure, has generated an adaptive response for the lower half of the building. The building is skinned with a modulating angled glass facade to create wintergardens. Without this added layer, the wind levels at height would make an outdoor balcony unusable. The unique glass-fronted ‘Sydney balconies’ conjure the idea of the quintessential verandah that can be used year round.